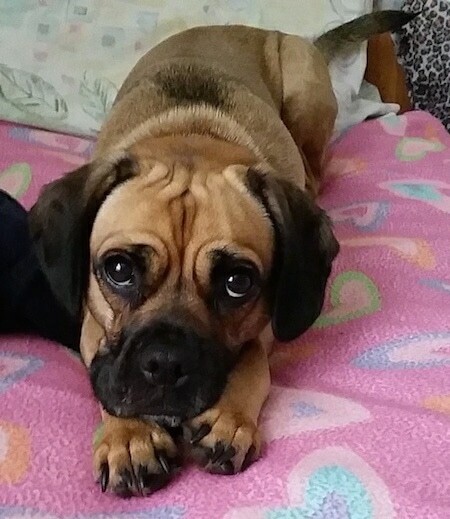 Shay the Cocker Pug (Cocker Spaniel / Pug mix) at 2 years and 5 months old—"Baby Shay Marie Jinkins is an energetic force to be reckoned with. A Diva in her own right. She always gets her way because she is a smart dog. The greatest pet we've ever had. The Cocker Pug is not a purebred dog. It is a cross between the Cocker Spaniel and the Pug. The best way to determine the temperament of a mixed breed is to look up all breeds in the cross and know you can get any combination of any of the characteristics found in either breed. Not all of these designer hybrid dogs being bred are 50% purebred to 50% purebred. It is very common for breeders to breed multi-generation crosses. 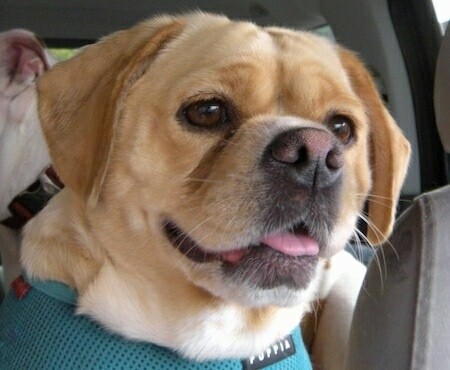 "Sparky's was the perfect blend of his mother who was a purebred American Cocker Spaniel (buff), and his father who was a purebred Pug (fawn). He was the size of a full-grown Cocker, weighing in at 35 lbs. 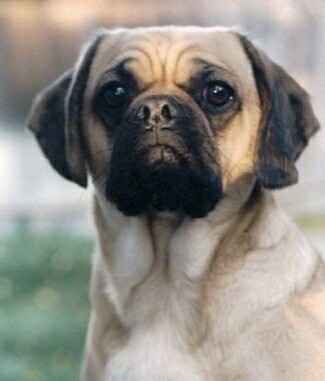 His ears were long and his snout was short, but not fully pugged. His tail was curled like a Pug. His coat was short, coarse and thick like a Pug, but was wavy by his tail. His eyes were prominent, but not "bugged" like a Pug. He was repeatedly mistaken for a Mastiff puppy, even to the age of nine. Sparky's disposition was even-tempered, tolerant and mellow. He never met a stranger. He had a courageous spirit and feared nothing. He was the happiest dog, and well known for his "full body wag." He was very curious and playful but not hyperactive." "Duke weighs in at 28 lbs. and he is 2 years old. 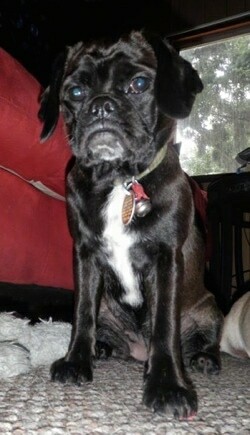 His mom was a black Cocker Spaniel AKC and his dad was a fawn Pug AKC. His tail is like the Cocker Spaniel and docked. He has an extremely soft and shiny jet black coat. He is solid like the Pug but the size of the Cocker. He is the best of both worlds. He was easily to train to sit, lie down, roll over, stay, and pretty much anything. He seems to know what you are saying. He is not too hyper like the Pug, but never runs out of energy for the long walks. Duke is a lap dog; happy and mellow and eager to please, yet our big protector!" Casey the black Pug / American Cocker Spaniel mix breed dog at 4 years old—notice the gray Casey is developing around his face. In comparison to human years, he is about 28 years old. "This is Sam. He is a 6-month-old Cocker Pug. He seems to have the personality of a Cocker; loves to play. He is 25 lb." "Sebastian the Cocker Pug puppy at 3 months old—his parents were both 18 lbs. full grown, so I'm guessing he will turn out to be the same. He is a loving, energetic and adorable pup, with a great temperament. I think he is a perfect example of a beautiful Cocker Spaniel x Pug." 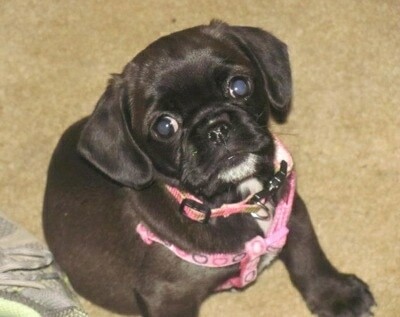 "Bindi the black Cocker Pug puppy at 2 months old—she is very intelligent. In only one month she learned sit, wait, leave it, lie down, and some more of the fun ones: dance, spin, shake, speak and roll over." "Bindi the Cocker Pug puppy at 7 months old weighs about 15 lbs. in this picture, and when we first got her she weighed 1 lb...so tiny!!! 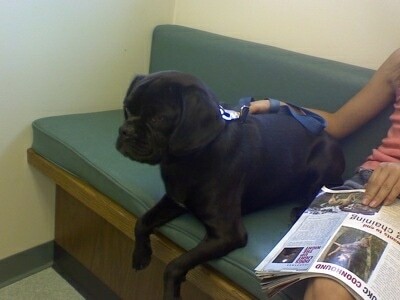 Her mother is a 10-lb black Pug and her father is a 20-lb. chocolate Cocker Spaniel." Cudjoe Key the Cocker Pug at 6 years old—"Cudjoe Key was a Cocker Pug who was the most loyal, lovable and best dog to be around. Although she was only 35lbs, she acted as if she were bigger and was the leader of all our dogs. Cudjoe was a great family dog who would never hurt anyone. Unfortunately, she was only 8 when she was diagnosed with cutaneous lymphosarcoma (skin cancer) and soon after died. She put up a fight to the very end and we were left broken hearted."